This week we had two Valentine’s Day comics, on Monday and Tuesday (February 13 and 14), and three regular comics, on Wednesday, Thursday, and Friday (February 15, 16, and 17). Next week we will return to our more common Monday-Wednesday-Friday schedule. 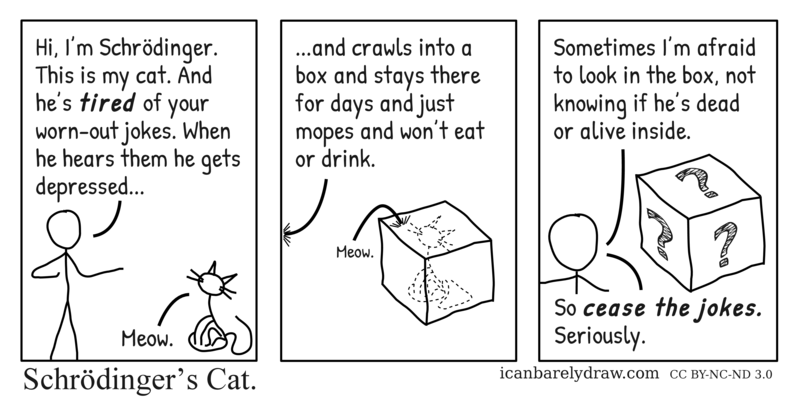 The next panel shows a box with the cat's outline, drawn in a dashed line, inside it. Voice: ...and crawls into a box and stays there for days and just mopes and won’t eat or drink. Cat (from inside box, in a smaller font): Meow. The next panel shows the box with three question marks, one on each of its three visible sides. The cat is no longer seen. Man: Sometimes I’m afraid to look in the box, not knowing if he’s dead or alive inside. Man: So cease the jokes. Seriously.